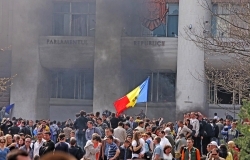 Protests against the results of the election in Moldova grew into major riots in the center of Chisinau. Under the heading "Village" it may well be that someone can find the reminiscent of his or her childhood, that somebody could plunge into their special mood and feel the most intimate and the dearest atmospheres once again. Anyone can recall their happy and carefree vacations spent in the countryside. Everyone will find something personal and special. There is various photographic spread of incredibly beautiful and picturesque nature, the sights of the Moldovan village, causing genuine delight even in the souls of experienced photographers, people in our country or just visitors - travellers. Monastery "Holy Myrrh-Bearers Martha and Mary"
The monastery was founded May 26th, 1997 with the blessing of His Grace Vladimir, Metropolitan of Chisinau and All.. This historical and archaeological complex is located 60 km north-east of Chisinau, between the villages of Butuceni..